Team Sonic Racing, is that you? We haven't seen Sumo Digital's cooperative kart racer in action for quite some time -- not since before its lengthy delay, in fact. Following a period filled with nothing but new music, a new trailer, put up today following the Sonic the Hedgehog panel at SXSW 2019, finally features some brand new gameplay footage. The video puts the focus on the karts, which are fully customisable; you're able to swap out parts to tinker with each car's stats, but you can also go to town with some cosmetic changes. You can select your favourite colours, horns, and decals to stand out from the pack. The game is still pegged for release on 21st May 2019. 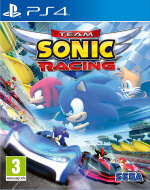 Are you excited to take Team Sonic Racing for a spin? Drift into the comments below. I can only hope this will be an acceptable follow up to Transformed. It does look better with each new trailer, I’ll admit. I'd really like for this to be good. Please make it good, SEGA. Cheers. That's looking rather good so far. As long as the gameplay is fun, then this should be a good game. @carlos82 Why not buy both? The game does look a lot better. There's a good chance I'll be picking it up since I enjoyed Transformed so much. I'm sure it's not as good but hey, hopefully I'm wrong! Already preordered:) CTR will also be purchased as well. Also Xenon racer is on the radar. Does no one else find it weird that they were heavily promoting the fact you can change the sound of the car horn? @Knuckles-Fajita ...and yet no sign of Tomoya Ohtani, who's infinitely more talented than everybody you just listed combined (with the exception of Richard Jacques who was originally, just as he did for ASR Transformed, doing the entire soundtrack all by himself before he got demoted / swapped out in a blind, post-Mania pandering panic). I'm really not one of "those" Sonic fans, but I'm totally one of "those" game soundtrack fans. @Oh_fiddlesticks It's likely that, during online races, the horn is the closest thing to an emote that individual players can use to distinguish themselves. Given how much other games charge for emotes, I'm pleased to see such a large selection of equivalents being included in the base game for no extra charge! @RogerRoger Any proof that Richard Jacques was swapped out for Jun Senoue? That's news to me. Also how would adding Jun Senoue be "Mania Pandering" when he had literally nothing to do with Mania? Tee Lopes and Hyper Potions, sure, but Jun hasn't worked on Sonic since 4.2, back in 2012, Tyler Smyth only worked on Forces, and a lot of the others are newcomers to the series. As for Ohtani, after working on Forces, and how some of that OST turned out, I think it's best he get a game off and work on the next, now confirmed mainline title to deliver his best work. @Knuckles-Fajita All early press releases, trailers and information about the game simply said "Music by Richard Jacques" (okay, granted, they'd only showed us one actual track and confirmed the returning courses by that point, but you'd think such an all-star musical line-up would've been newsworthy from the get-go; also, that one track was Planet Wisp and when they released the music from it, it was suddenly plagued by Jun Senoue's identikit guitar work). It was only just before the game was delayed that they added everybody else in, which was in the wake of Mania's reception. I was closely monitoring this game for the promise of another Richard Jacques soundtrack, like ASR Transformed, and so the news of everybody else cramming in was a bitter disappointment. Jun Senoue has gotten a rockstar reception at nearly every Summer of Sonic convention ever held, and SEGA knows this. He's very clearly a name being deployed to get older fans on board. He might not be directly connected to Mania, but his name is being used in exactly the same way. "Don't worry, this is gonna be exactly as you remember it, it's a safe Sonic game!" But hey, this is all about music, and music is subjective. A lot of this is being deduced by me and my opinion. I note that just before I claim that Sonic Forces had a far, far, FAR better soundtrack than Mania could have ever hoped for, and all my credibility disappears in an instant. Looks cool, but since CTR is releasing so soon after I'm not sure if I'm gonna bother. I'm picking this up now. Sure CTR is good too, but that is a game I've already played to death. Sonic is a new experience. Plus Transformed was awesome.